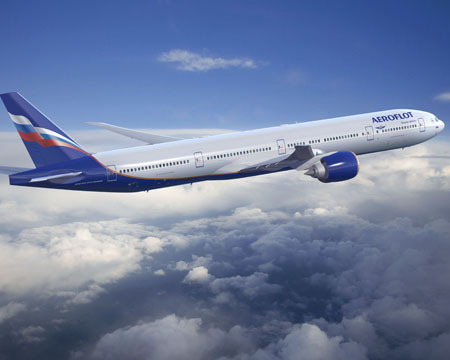 LE BOURGET, France, June 21, 2011 /PRNewswire/ -- Boeing (NYSE: BA) and Aeroflot Russian Airlines today announced an order at the Paris Air Show for eight Boeing 777-300ERs (extended range) jetliners. "The Boeing 777 will strengthen our long-haul capabilities," said Vitaly Saveliev, director general of Aeroflot Russian Airlines. "These airplanes will play a critical role in our network expansion strategy, particularly the international growth opportunities we expect from our joint businesses with SkyTeam partners when servicing the Sochi 2014 Olympic Games and the 2018 Football World Cup." "Aeroflot is expanding the strategic capabilities of its long-haul fleet," said Jim Albaugh, president and CEO of Boeing Commercial Airplanes. "We're very grateful for the confidence Aeroflot has placed in Boeing -- and in the 777." The Boeing 777 is the world's most successful twin-engine, long-haul airplane, distinguished by its fuel-efficiency, spacious cabin interior, range capability, commonality with the 767 and the 787, and its reliability. Featuring wider seats, wider aisles, more headroom and more seating, the Boeing 777 Signature Interior is preferred by passengers. For the fourth straight year, American Express Executive Travel Magazine readers voted the 777 as their favorite airplane. Russia is an important supplier for the Boeing 777 family. VSMPO, a subsidiary of Rostechnologii State Corporation, manufactures large titanium forgings for landing gears, wings and pylon of the 777 jetliner. Russian engineers at the Moscow Boeing Design Center and IT experts from Russian software companies actively participated in designing the 777-300ER. Aeroflot is the largest airline and the national carrier in Russia. Its overall flight network comprises 898 locations in 169 countries. In 2010, 11.3 million passengers used Aeroflot's services and about 14 million used the services offered by the Aeroflot group. Consisting of 107 airplanes, Aeroflot is a member of SkyTeam, the global airline alliance. To date, nine of 13 SkyTeam members have ordered a total of 171 777s. The order was previously attributed to an unidentified customer on Boeing's Orders and Deliveries website.